Exhibited in 1887, The Dining Room depicts a scene from bourgeois life. At a large round table covered in a white tablecloth (which takes up more than a third of the painting) sits an old man with grey hair and prominent sideburns and a woman who is somewhat younger. Coffee is being taken after lunch; the gentleman is smoking a cigar; a maid brings a newspaper into the room; the woman is taking a sip of coffee. There is no eye contact between the protagonists – they seem to be lost in private reflection. Their world is hidden behind heavy drapes and net curtains; the large houseplants, so popular in the late nineteenth century, located next to the window, further encloses them, adding to a stiflingly formal atmosphere. 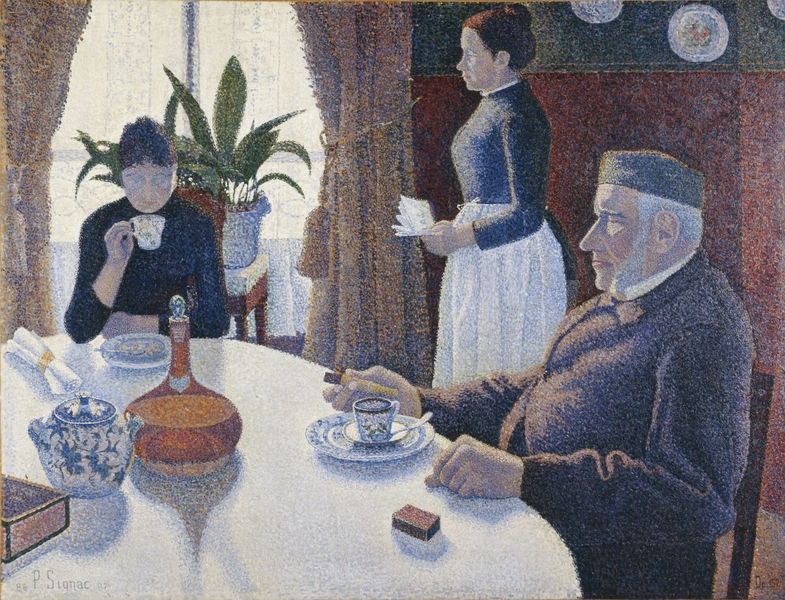 The painting surely contains a negative comment on bourgeois life but there is also some ambiguity as the old man is a portrait of Signac’s amiable grandfather. Jules Signac had built a very successful saddlery business which was sold when his son (Paul’s father) died. (This was the family money that allowed Signac to take up painting free from financial worries). Jules had retired to Asnières with Paul’s mother who may be the woman raising the cup of coffee to her lips. Beneath the scintillating surface of dots and touches of colour the painting started life with several layers of broad brushstrokes. Once the structure of the composition had been established Signac began to overlay this initial version with gradually diminishing dashes of pigment. Further, smaller dots were added at a late stage to enhance the colour balance in certain areas to Signac’s satisfaction. The light from the window creates shadows which are most apparent on the white tablecloth; in the shadows cast by the blue plates cups and bowl Signac uses dabs of orange and yellow – the complementary colour for the predominantly blue service. When the painting was first exhibited at the Salon des Indépendants in 1887 the critic Paul Adam mentioned ‘the very expert gradation of the hues’ and as Signac later wrote: ‘the separated elements will be reconstituted into brilliantly coloured lights’. The subject seems to have been inspired by a painting by Gustave Caillebotte entitled Luncheon which was exhibited in 1876, showing three individuals in a very similar arrangement with a large table dominating the composition. Caillebotte painted a number of impressionist canvasses which feature the middle classes doing nothing more than gazing from a window or a balcony – ennui is pervasive. Signac’s painting seems to echo this listless atmosphere. We are certainly a long way from Renoir’s Luncheon of the Boating Party, a paean to a more joyous lunch.